The C3 Weapons light from LUCID Optics was born from a desire to push back against the darkness and manage things that may go bump in the night. We overbuilt this little unit in a 6061 aluminum housing, making it waterproof and shockproof up to .458SOCOM, because we know how gentle our customers treat their gear. This super durable and shockingly powerful torch at 300 LUMENS is guaranteed to shed light on the situation, so you can make a good decision on threat management. Specifically designed from the ground up, for use on a carbine, under the consult of those who hunt bad guys for a living, not by a suit in a high rise building. This low profile torch has a simple on off pressure switch function for hands free operation and a highly disorienting strobe with near seizure causing function, with a simple press and hold of the switch. Powered by (3) AAA batteries that you can find nearly anywhere. Simple, Durable and exceeding expectations, with a run time of just over 3 hours of continual use. 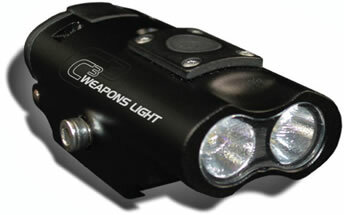 Considering the high value and super affordable price point, not to mention the Lifetime Warranty, this is truly a weapons light, done right.